Description: Digital inkjet print of “The Spirit Illuminates Everything” from Grace’s series of proverb paintings that began as part of the Small Graces charity project. Unframed and signed by the artist. Can be personalized (ex.”To Sam With Best Wishes, Grace Lin”) upon request. Print is not archival. This print will last longest when kept away from natural light. Bio: Grace Lin is the author and illustrator of picture books, early readers and middle grade novels. Grace’s 2010 Newbery Honor book WHERE THE MOUNTAIN MEETS THE MOON was chosen for Al Roker’s Today Show Kid’s Book Club and was a NY Times Bestseller. LING & TING, Grace’s first early reader, was honored with the Theodor Geisel Honor in 2011. An Astrid Lindgren Memorial Award nominee for the US, most of Grace’s books are about the Asian-American experience because she believes, “Books erase bias, they make the uncommon everyday, and the mundane exotic. A book makes all cultures universal.” See more about Grace and her work at http://www.gracelin.com. This is BEAUTIFUL, Grace!! I’ll start the bid at $20. I am in love…I bid $25! 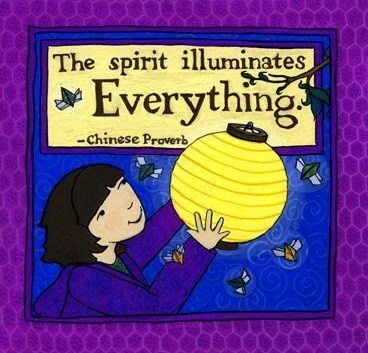 “The Spirit Illuminates Everything”… isn’t that the truth. Beautiful. WINNER: Emme Licygiewicz wins with a generous overbid of $250! Congratulations on your winning bid. I will be in touch later today with instructions for making and verifying the UNICEF donation. Sorry. You definitely should have received an email by now. I’ll look into it after the weekend. It went out on April 5th. I am resending–check your spam filter if you don’t receive it.